KPodder started life as BPConf is a simple KDE configuration frontend for BashPodder by Linc Fessenden. KPodder has evolved a bit more since then but is basically the same thing with more options and a more flexible script. Its for collecting podcasts from across the web. Simply select the feeds, where you want them saved, and it will collect the files for you. You can check what casts are available from a feed, and alter what casts are marked as already downloaded. You can ask it to check on your feeds by simply hitting check Now, or ask the program to set up a cronjob to do that for you on a regular basis. All the feeds can be checked at the same time or individually. Changed the name, Added sub directory types and individual feed intervals. Changes to script for new features, and also moved script to be in path. Changed around configuration files so they sit in KPodder's kde user direcory rather than the data directory. By default this will install KPodder under the /usr/local/kde prefix. To alter where its installed add --prefix=thepathtoinstall as an option to configure. Usually this is something like /usr or /opt/kde. KPodder is a very simply utility to use, and tries to do as much for you as possible. One thing to note is that some websites do not set the mimetype of their feed correctly and simply has it set to a type of text/plain. The default handler for this type is usually a text editor, and having KPodder change this would cause problems. If the feed you want has this problem instead of clicking the link right click it and select Copy Link Address. Open KPodder press Add and paste the url into the URL text input. 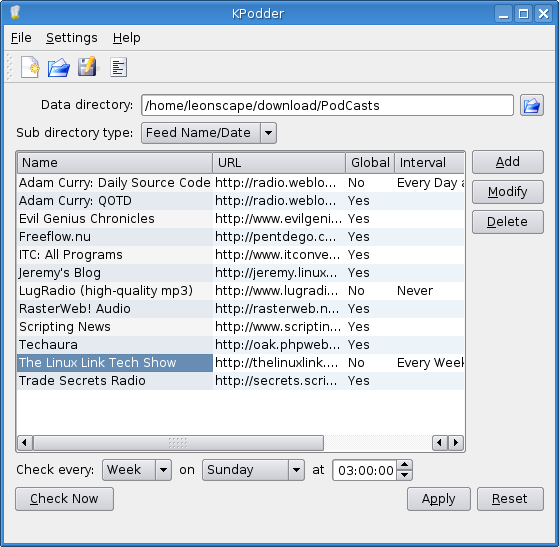 The first thing to set when using KPodder is the Data Directory, this is the directory where the sub directories will be created ( named for the dates they are created or the name of the feed ) and these are where the podcast sound files will be stored. If you already use BashPodder its probably easiest to select the directory where you already have placed it, then select File->Import Configuration File... and select the bp.conf file you have been using. If you want KPodder 0.6 to know which files you've already downloaded then click File->Import BashPodder log... and select the podcast.log file. The first thing to do is to put the URL of the feed into the Dialog. You can then either select the Get name from feed checkbox, or Type in the name your self. Either way at this point you have the option of downloading a list of the podcasts currently available from the feed. If you have selected the Get name box, it will also fill in the name of the feed. Hit the Download Cast list button. Now if for some reason it can't download the file, or its in a format that KPodder can't understand, All that will happen is the button will become greyed out. However of it is in a format it understands it will fill in the details for you. Next to every item in the Cast list, is a checkbox marked Logged. This means that this cast has been marked as downloaded according to KPodder. This way you can control what will be downloaded, If you already have some of these files, or you wish to download one again, you can check and uncheck them here. The checkbox Use global checking sets whether the feed will use its own interval settings or the main one set on the main screen. If you uncheck this box, the interval controls will become active, and you can set them exactly the same way as you do on the main screen check interval control. Modify works in exactly the same way as add, so you can always return to alter the settings later. Delete will remove the feeds. KPodder can set up a crontab entry for you to initiate downloading your podcasts on a regular basis. Simply select the desired interval, and the other options it gives you. Hour This will set the checking for every hour on the hour. Day This will check the podcasts every day. A 24 clock widget will appear for you to enter what time you would like the list to be checked. Week This sets the interval for every week. You will need to select what day of the week you would like the podcasts to be checked also what time of the day to check them. Month This sets the interval for every month, rather than tying you to particular day, you must enter a date in the text box provided. It can also be more than one, you must separate dates with commas, and there should be no spaces. Entering 5,10,15,20 will check every month on the 5th 10th 15th and 20th. You then can select a time for when the casts are to be checked on the dates. Apply commits all your changes, and Reset puts everthing back as it was from the last apply. Hitting the Check Now button starts the script then and there, and begin checking the podcasts for what it should download. KPodder can take a while to download all the files, but don't worry You can carry on editing if you wish, you can also close down KPodder, and the script will continue.